We considered running a 511 (Bathurst Stn-Union Stn) service but ruled it out for two main reasons. Firstly, stop usage on Fleet west of Bathurst has greatly increased in the last year, and serving these stops only with the shuttle bus would introduce a transfer or longer walk for too many people. Secondly, because of the road configuration and traffic patterns, it is not possible to have a northbound stop for through 511 cars on Bathurst at Lake Shore. The nearest stop would be the existing 509 stop on Bathurst farside of Queens Quay. This adds to the walking distance for customers heading to Fleet Street, and requires customers to cross an inhospitable intersection. The new year brings changes to some routes, mainly on the streetcar system, to deal with the shortage of new Flexitys and a construction project while improving service on 501 Queen, 502 Downtowner and 503 Kingston Road to better reflect actual conditions. Schedules for the 510 service have been revised based on operation of all runs by low floor Flexity cars, and the route is now officially “accessible”. Headways will be widened during many periods to reflect the larger vehicle capacity. In the event that enough Flexitys are not available, ALRVs (the longer of the “old” cars commonly seen on 501 Queen and 504 King) will substitute. Exhibition Loop will be closed to streetcars for much of 2016, with an interim opening in August for the CNE, to permit both TTC track work and Metrolinx construction adjacent to the loop. 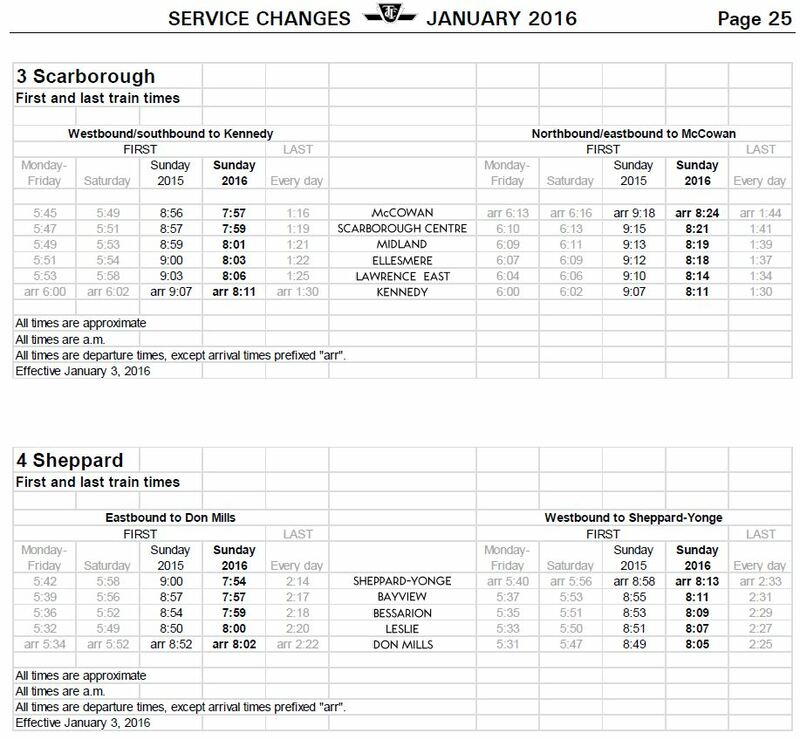 All 510 Bathurst and 509 Harbourfront service will turn back from Fleet Loop. A shuttle bus will operate between the CNE (looping on street within the grounds) and Bathurst/Fleet. The 310 Bathurst night bus will use the same on-street loop at the CNE as the daytime shuttle. The 502 Downtowner and 503 Kingston Road routes will be converted to buses to free up streetcars for other routes. Although headways will not change, the scheduled running times will be extended so that buses (and eventually streetcars) will be able to cover their full routes in the time allowed and, in theory, short turns will end. This is especially important for routes which can be functionally useless because they short turn before reaching their markets downtown and on Kingston Road. Some of the streetcars from 502/503 will shift to 504 King replacing existing bus runs. All of the ALRV service on King will be replaced by CLRVs so that the ALRV fleet is available for the revised 501 schedule. 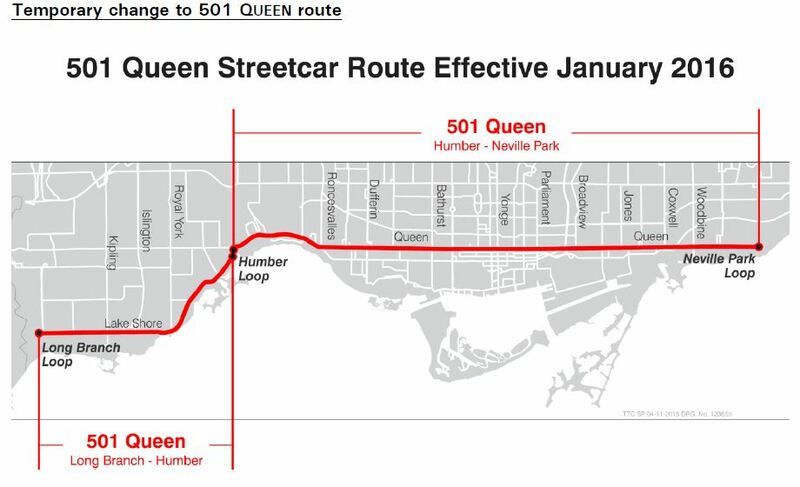 The 501 Queen service will be split at Humber Loop on a temporary basis so that the ALRV fleet can be concentrated on the Humber-Neville section of the route. 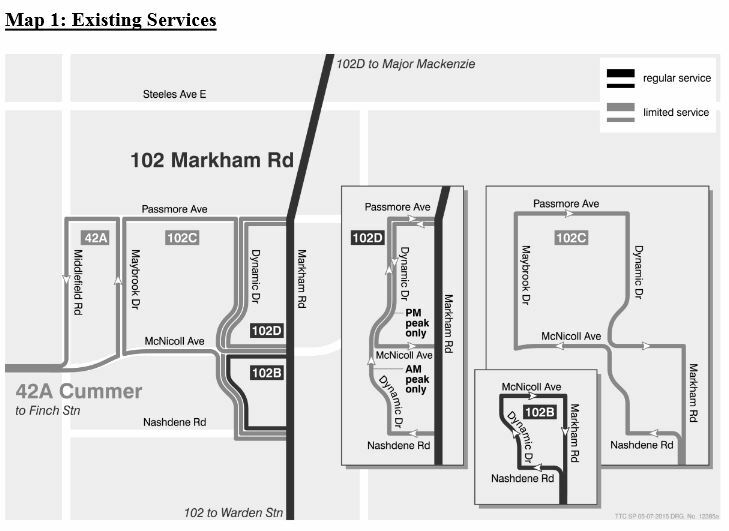 Scheduled headways east of Humber will be generally improved, and running times have been changed to reflect on-street conditions. This arrangement should greatly reduce the need for short turns and provide improved service on the main part of the Queen route (subject to the usual problems with headway reliability and management). Service from Humber to Long Branch will operate at most hours every 10 minutes. During late evenings, there will be a transition from a split service at Humber to a through Neville-Long Branch service leading eventually into the 301 Queen Night car. The details of this transition have not been announced. Three trippers from Long Branch to Broadview will operate during the AM peak providing a limited amount of through service from southern Etobicoke to downtown. 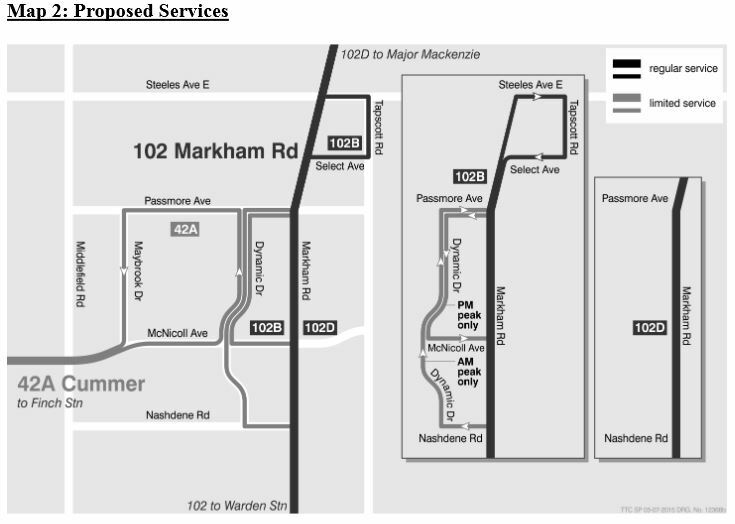 In Northern Scarborough, the 42 Cummer and 102 Markham Road bus routes will be reorganized to better serve the Tapscott Employment District. 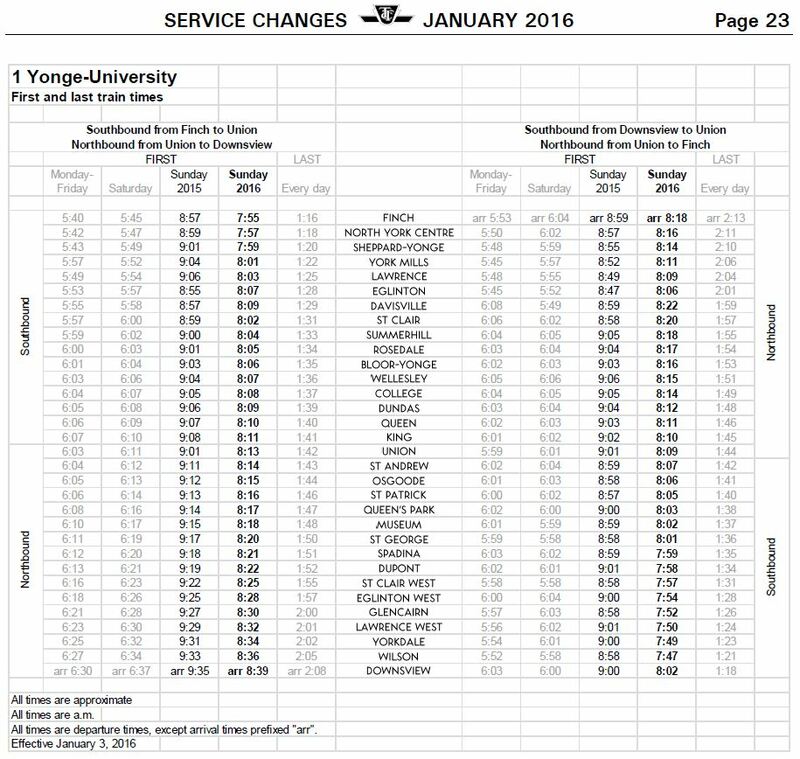 This change was approved by the TTC Board in September 2015. As previously announced, subway service will begin at about 8:00 am on Sunday, up to an hour earlier than current schedules. The start times of surface routes will be adjusted to match this later this year for those cases where service is not already on the street before subway service begins. 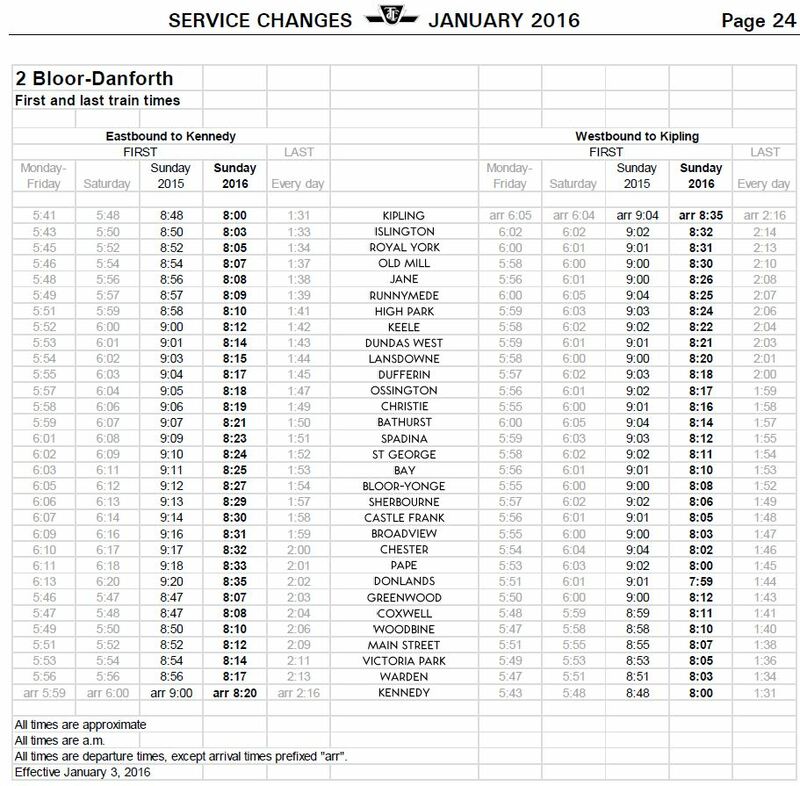 Similarly, the night bus schedules for 300 Bloor-Danforth and 320 Yonge have not yet been changed, and so these routes will continue, for a time, to operate after the subway has opened. I’ve always thought the geometry of the CLRV’s and ALRV’s between the bogies were the same. What exactly would make an ALRV derail but not a CLRV? Steve: The force to push the front section must be transferred through the articulation in an ALRV whereas in a CLRV the frame carries the load all the way to the front of the car. In an ALRV, the pushing force is going in a different direction than the front half of the car. There is a similar problem when a CLRV pushes another CLRV, but this is all handled through the car frames and the drawbar, not through a portion of the vehicle that is designed to flex. Note that Union Loop is a special case because the curve radius is so tight. Beginning on January 3rd of the new year, TTC will run shuttle buses on part of the “509 Harbourfront” and “511 Bathurst” streetcar routes. Perople heading to Exhibition Place and nearby Liberty Village (north of the GO railway tracks) should get accustomed to making a transfer to complete their trip. However, people heading to Historic Fort York will continue to ly step off the (“511 Bathurst”) streetcar at the Fleet Street loop, then walk northbound to the new Visitor Centre on the south side of the Garrison Common. There won’t be any diverting of the “511 Bathurst” streetcar to Union Station via Queens Quay west like there was for most of 2007 and the early/winter months of 2008, when the streetcar tracks of Fleet Street were rebuilt; many people heading to Exhibition place made the transfer to shuttle buses on the “509 Harbourfront” route, which made their trip longer. This work will be completed just in time for the Canadian National Exhibition, running August 19-September 5, 2016. Also, the “511 Bathurst” route will become the next one to use the LFLRV streetcars. I have yet to see a notice of the upcoming route split on any Queen car stops. Based on experience with both 508 cars and eastbound 501 Humber cars, many riders won’t get on a streetcar that doesn’t have the “usual” destination sign. I also wonder if streetcars turning back eastbound at Humber will lay over and pick up on the north side of the loop at the shelter, or follow current practice of pulling around to the south side to lay over, and then picking up at the exit of the loop. This was necessary to avoid blocking through cars to Long Branch. In the old days of the separate 507, as I recall, eastbound loading was mostly or completely done at the shelter before going round the loop. The obvious problem with loading at the eastbound exit of the loop is that there’s no proper paved path or waiting area; it’s just the usual sandy mud (and snow in winter). Steve: Yes, in the old days of a separate Long Branch car, the Queen cars loaded opposite the waiting shelter facing outbound. Considering there will be some through service, including cars going into/out of service, riders waiting at Humber to go west will have two possible loading points (Long Branch turnback loop and westbound through tracks), while those going east will have three (point five!) loading points (westbound tracks before switch to turnback loop; exit of the eastbound loops [could be either track for the ‘point five’! ]; eastbound through tracks). Needless to say, this will be a scramble for the able-bodied; good luck if you’re a slow walker. I presume that Long Branch cars will have to lay over by the west side of the shelter before going around the loop, which should mean that they load passengers while laying over. This is not the current practice at both Humber and Long Branch loops, where the operators run around to the far side and hide for their layover (and of course one can no longer board at Neville loop at all). This is only a lot of transit trivia right now, but once the streetcar lines become accessible, passenger drop-off and pick-up points at loops will have to be carefully considered. (I love being dropped off in the mud at the entrance of Long Branch loop, since my local stop got removed to speed service because the TTC “didn’t like” the 39th Street stops. We are on day 4 of the new changes and already the ALRV’s are gone and there are 5 CLRV’s in their place filling the supposed all Flexity schedule. 510 users are being punished for the TTC management’s incompetence here. Despite all the talk here about about ALRVs not being used at the Union Station loop, keeping an eye on the Nextbus data for last Friday and today – that’s exactly what TTC is doing. Running ALRVs into Union. Steve: Yes, and they have operators on the platform to watch for swing-out problems. Sigh. Won’t there be a similar problem with LFLRV’s in the Union loop, since they have articulations as well? Steve: The cars were designed to deal with this. It was one of those “Toronto specific” specs. I can’t help but notice the bigger cars and longer headways on Spadina has led to bigger gaps rather than more evenly spaced service. Steve: TTC claimed it would be easier to manage with fewer cars, but that is one of their standard myths. Operative word here is “manage”.